Background: Natural endometrium in Frozen-thawed Embryo Transfer (FET) may have some benefits upon implantation in patients with Repeated Implantation Failure (RIF). It might be due to possible differences between natural and stimulated endometrial growth factors and cytokins secretions. Objective: The objective of this study was to compare the pregnancy rate of FET on modified natural cycle versus hormone replacement therapy (HRT) cycle endometrium in patients with RIF. 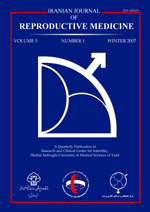 Materials and Methods: In this observational study the pregnancy rate of patients with RIF undergoing day 3 FET in natural cycle endometrium (group 1, n=56), were compared with another group of patients with RIF in whom frozen-thawed day 3 embryos were transferred on HRT cycle (group 2, n=52). Results: The pregnancy rate in group 1 was 41.07%, compared with the pregnancy rate of group 2; 36.5% (p=0.63). The abortion rate was not significantly different among the groups. Conclusion: It can be concluded that FET in a modified natural cycle is comparable with HRT cycle in patients with RIF.